GoTriangle has won a $943,000 grant through the federal government’s Low- or No-Emission Grant program to help the agency buy its first electric buses. Research Triangle Park, NC (Aug. 27, 2018) – GoTriangle has won a $943,000 grant through the federal government’s Low- or No-Emission Grant program to help the agency buy its first electric buses. GoTriangle applied for the grant this summer and will put the money toward buying two 40-foot electric Proterra buses, which can cost between $300,000 to $450,000 more than a diesel bus when charging stations and other needed equipment are included. 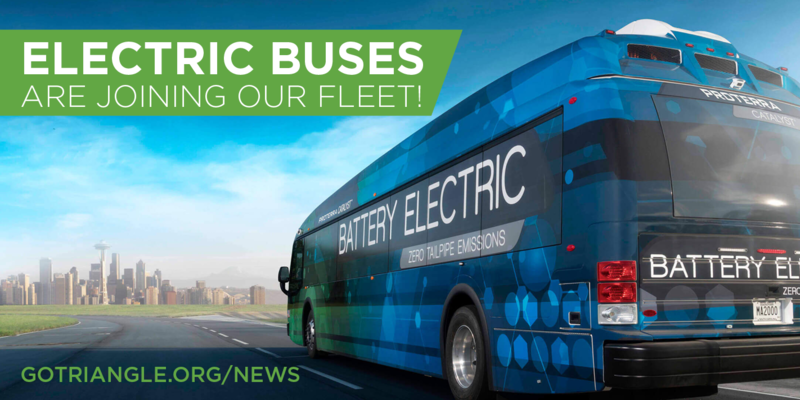 However, the operating cost over the lifespan of an electric bus is $250,000 to $400,000 less than a diesel bus, and electric buses produce no tailpipe emissions. GoTriangle should be able to order the buses within 90 days, with delivery in 18 to 24 months, Mann said. Last week, the Federal Transit Administration announced $84.45 million in grants for 52 projects in 41 states. In North Carolina, in addition to GoTriangle, Greensboro won $1.9 million and Chapel Hill won $1.38 million to replace older vehicles with electric buses. The federal Low or No Emission Competitive Grant Program provides money so state and local governmental authorities can buy or lease zero-emission and low-emission transit buses. The money also can go toward acquiring, building or leasing supporting facilities. Proterra, whose East Coast manufacturing is based in South Carolina, touts that 75 percent of the bus components it uses are made in 34 U.S. states. Each day, the Triangle adds more than 80 residents to its 2 million-plus population, making the role GoTriangle plays as the regional public transportation authority increasingly vital to maintaining our area’s quality of life. With 67 vehicles traveling 14 regional routes and eight express routes, GoTriangle provides about 7,000 daily passenger trips or about 1.8 million trips a year. GoTriangle also provides the area’s only transit access to Raleigh-Durham International Airport, which served a record-setting 11.6 million passengers in 2017.